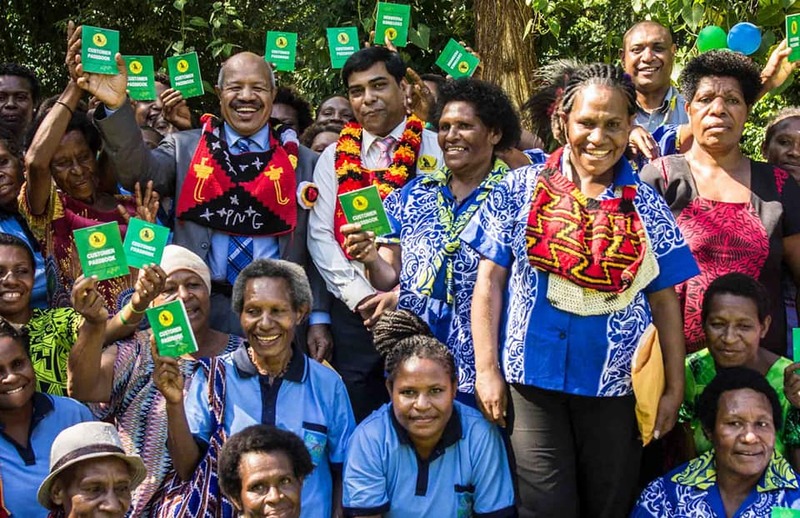 Economic empowerment of women will not only help improve the status of women in PNG but also contribute to the country's greater economic and social future, according to NCD Governor Powes Parkop. "Traditionally women have been wealth creators in PNG. They are the ones who raise pigs, do the gardening apart from caring for their families. This is the strength and potential women have in PNG to improve their own lives and status, and to contribute to a greater social and economic outcome for the nation. This potential must be harnessed to make equality real and to create more wealth for the nation," he said. Governor Parkop was speaking at a small ceremony today at Nature Park for awarding of 114 Savings Account Passbook for women from Morata who had undergone basic financial literacy training funded by NCDC at end of 2016 under program initiative by late women’s champion and Commissioner of the Board of NCDC Ms Janet Sape called Givim Han Long Life. NCDC has reaffirmed its commitment in ensuring women involving in small-to-medium businesses in the city are empowered as a pathway for helping nationals to take full or major control over the country’s economy. NCD Governor Powes Parkop said empowerment of women on all fronts was a catalyst to fully advance the country’s development. “What makes a society, a city or nation great-for a brighter future-is by empowering their women. This is a proven pathway that is in our tradition and so we must tap or harness this to secure a better future both economically and socially. It will benefit women and the entire nation said Mr Parkop. He reminded fellow menfolk to recognize this potential and abilities in women, and to learn to treat them as equal citizens and not as ill-perceived norms and cultures. Many of the women receiving the passbook were illiterates and they underwent a financial literacy program that qualified then to have their passbook bank accounts opened with Women’s Micro Bank. It was facilitated by Rural and Urban Women Empowerment Foundation, a non-government organisation based at the Morata suburb. Govenror Parkop paid tribute to late Janet Sape as a passionate and strong advocate for women’s empowerment particularly economic empowerment and equality. He also thank Ms Janet Banebo the Executive Director of Urban and Rural Development Foundation for maintaining the program with the passing of Ms Janet Sape. Governor Parkop said NCDC provided start-up capital of K300, 000 for the establishment of the bank and to support Women in Business which was the main driving force behind the Women’s Micro Bank. He expressed his gratitude to the bank and was happy that the fruit of that investment has produced 20, 000 customers nationwide whilst over 9000 of the members were women in business. He noted in the past that under his leadership NCDC has also allocated K1 million in the National Development Bank to support SMEs under a micro finance scheme during his second term in office but was disappointed that the result was poor due to bad attitude as poor preparation of recipients. Parkop would like to see the program be extended to other suburbs as well especially those that has not been reached. “We will continue to support you. We should do away with our tradition of being restricted to markets just for daily income. I want to see you all step up and start venturing into mini-business and make a long term commitment to build your business ,” he told them. Parkop further stated that he was planning to build trade centres for women at strategic locations in the city in order to make this transformation materialized. However, he said, the challenge for him and the city hall is to identify parcels of land first to drive this policy. He added that the government was upgrading the 6-mile market, when completed, will become an SME centre with kiosks or small shops which will show case this progress from just daily market to starting real businesses. Governor Parkop also paid a tribute to female unsung heroes in the society for voluntarily furthering the empowerment work.